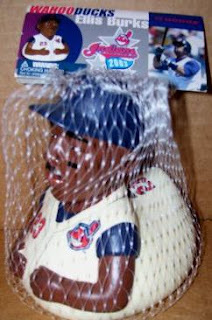 Indians Baseball Cards: Wahoo Duck! Is that a "Celebriduck"? I have a couple of Ivan Rodriguez and think they are pretty cool. Looking for someone to trade the Rusty Greer one to me. I have an Omar duck. Maybe two. BigDBO, I have ben looking for an Omar ever since I picked up the Burks. If you're interested in selling or trading, let me know! Email me.